After discussing the first two arcs in Part One, our Season Five in review continues with the two middle arcs: the D-Squad mission and the eventful, shocking, and spectacular storyline involving Darth Maul, Death Watch, and Obi-Wan Kenobi – with the future of Mandalore at stake. The D-Squad arc seemed to underwhelm a lot of fans, not just for the “experimental” style but also its focus on very minor characters in a seemingly very tangential plotline. 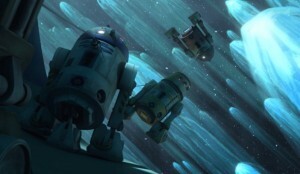 After the two droid-centric episodes were less than fan-favorites last season, do you think it was a bad idea to devote four episodes to this arc this season? Tricia: The D-Squad arc highlights what I think will be the difference between a Disney Star Wars and George Lucas’ Star Wars. Dave Filoni admits in interviews that this arc intimidated most of the storytellers, and I think their gut instincts were right. There just wasn’t enough of a story to captivate the audience; it became about the “art” of making something unique and different. But Star Wars has sold The Clone Wars series to a customer and I don’t think it delivered keeping its audience invested in the show. In the future, a story like this might get pitched, and the suit-in-charge will tell the story team that they get one episode to be bold and artistic. A series can’t run that far away from the mainline characters. The reception of last season’s two-droid arc was a strong indication this arc would be more miss than hit. I can’t even see an upside for the long run, like some great licensed products from the droid characters. Unfortunately, too many indulgent episodes like these hurt the show when it came down to decision time for the series. Lex: The first episode of the arc, “Secret Weapons,” was a fun change of pace compared to some of the very serious, grim stories in Season Five. 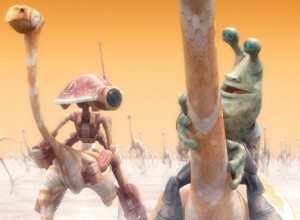 I found Colonel Gascon to be more annoying than amusing, but the five droids had just enough personality to get me to care about their success. I particularly liked the moment when the other droids refused to leave BZ behind. Their teamwork was fun to watch, and the episode made good use of humor, too. As a standalone adventure, or as part of a war-story arc built around Jedi or clonetroopers, I would have enjoyed this episode quite a bit. Instead, though, the rest of the arc really didn’t connect with me. “A Sunny Day in the Void” was dull and weird, and tried too hard to be “innovative” instead of actually entertaining. “Missing in Action” would have been better as part of a clone-centric story, similar to “The Deserter” in Season Two, and the attempted tension in “Point of No Return” fell flat for me. Worst of all, the arc was supposed to end with the hilarious irony that the encryption module would have decoded the very same sneak attack on the Republic strategy conference that D-Squad ends up riding back aboard anyway – except that reveal was cut from the episode. What was the point of a four-episode meta-joke without actually delivering the punchline? Megan: Approaching D-Squad as “art” is touchy, I think, because although I disagree with Lex and believe that “A Sunny Day in the Void” was one of the few episodes that made the things in this arc feel important and introduced some ideas, this was the least successful arc in a while for me, partly because it did feel so disconnected to the Star Wars universe as a whole. That’s not to say that stories about tangential characters can’t be good, but D-Squad just fell flat in so many ways, and the attempts at humor were largely just that – attempts. The tone of these four episodes varied so widely that they hardly felt like an arc at all, almost more of a pitch for a separate show like “Young Jedi” may have been. I don’t think D-Squad should have been four episodes, because there just wasn’t enough reason to follow these new characters. The relationship between Gascon and WAC tried, but was hurt by the fact that over four episodes both of them became, or remained, annoying and inconsistent. The arc almost went out of its way not to mean anything: Gascon wasn’t respected any more highly at the end, and like Lex said, the information chip that could have tied all four episodes together was forgotten. I have to wonder whether this was intentional. Brent Friedman wrote this arc, as well as the arc about Obi-Wan in disguise in Season Four, and I greatly enjoy a lot of his work on the Halo Expanded Universe, as well. He did want “A Sunny Day in the Void” to be all about meaninglessness, so I like to think some of it was intentionally off-putting. I tried in my reviews, perhaps too hard, to find some common meaning in the four very different stories. These episodes still weren’t enjoyable to me, however, either as straight adventure stories or as art designed to be unsettling. I don’t think the flaws of the D-Squard arc would have lessened if it had only been one episode about Gascon and WAC, but at least it would have been shorter. Some of the better concepts, such as the existence of Gregor and Abafar’s Void, could have involved the main three Jedi instead. Like Tricia said, it’s interesting to think that it’s likely we’ll get less like this from Disney. 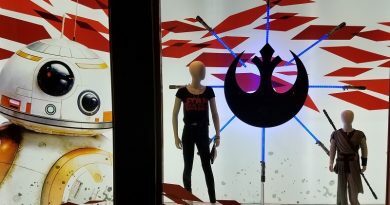 They seem to want to keep Star Wars on-message, even though the fans are not exactly sure what message that is yet, and I’m not complaining about that. I’m a bit off-track (again!) and haven’t addressed last season’s droid arc, which was experimental and bizarre in different ways. I would have thought that fan reaction would have kept the team from banking on more episodes like that, but perhaps ratings didn’t reflect its “less than favorite” status. That aspect is a mystery to me. Over the course of Seasons Four and Five, Darth Maul’s character followed a trajectory from delusional Spider-Maul to crime lord to leader of Mandalore. Do you think this storyline for the character paid off the decision to bring him back? Tricia: Darth Maul’s arc was a huge risk. I sense a theme. 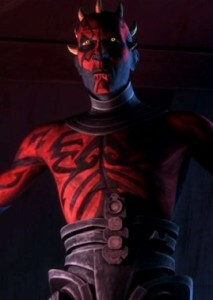 But this one paid off because of the combined efforts of the writers, the animators, and Maul’s voice actor, Sam Witwer. In The Phantom Menace Maul simmered with raw energy, and fans had been captivated by that. It didn’t hurt that Ray Park has been good to his fans over the years. Really the pay-off in Maul is that he has a basis in the Star Wars saga lore. We see how it was possible that Anakin held onto life on that bank of the lava river. It’s an unnatural act, purely of the dark side, which makes the bad guys all the more horrifying. Lex: When we learned Maul was being brought back, I was apprehensive it might involve a contrived explanation, an ineffective plotline that ended up just being essentially a publicity stunt, or an underwhelming resolution not worthy of the premise. Fortunately, The Clone Wars succeeded in really delivering a powerful story with Maul. From the unnatural horrors of the power to cheat death to the political machinations of a Sith mastermind, the episodes with Maul really showcased why the Sith are such a threat to the Jedi, and to the galaxy. In fact, I would say now that Maul is a much more interesting Sith than Count Dooku, even though in total Darth Tyranus gets a lot more screen-time in the movies and The Clone Wars. Megan: I’m actually looking at this question from the opposite direction, because I felt that bringing him back was pay-off in itself, and his ascent to crime lord/leader of Mandalore dulled what made him unique in The Phantom Menace. Unlike Darth Sidious or Darth Bane, or to a lesser extent Dooku and Grievous, Maul had never wanted to rule over anything in the movies. The fact that he did in The Clone Wars made him less unique. It was a challenge for me to reconcile the obedient apprentice with the warlord. It seemed to me like they wanted to bring Maul back because he was a recognizable popular face, but not because he could do things for the story that no other Sith could do. That doesn’t mean that I didn’t enjoy his presence: it led to some of the coolest scenes and plots in the show, which segues nicely into the next question. In “The Lawless” we got to see Darth Sidious unleash the full extent of his power upon Maul and Savage. Was the smackdown worth the wait? Lex: Absolutely! It reminds how, starting with The Phantom Menace, the lightsaber fights in the Prequels were just so visually amazing compared to the Original Trilogy. Watching Sidious take down Maul and Savage in “The Lawless” really made me wish the fight against the Jedi Masters in Revenge of the Sith, and starting with the four-on-one and ending with the man-to-man with Mace, could have been as acrobatic and Force-powered as this duel. 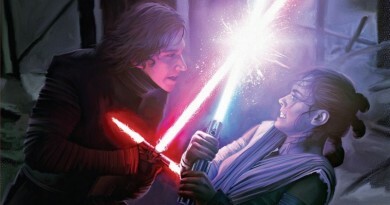 The Sequel Trilogy will be hard pressed to top this! Megan: This was really the culmination of the Sith brothers’ story. I’d been waiting to see how Sidious would get involved since Savage was introduced, and the fight when he did, and that cliffhanger about Maul’s fate, were fantastic. Everything from the Maul vs. Pre Viszla fight to Sidious taking down Maul and Savage was viciously choreographed and had me, as they say, on the edge of my seat. The Maul arc featured a significant role for the Mandalorian warrior Bo-Katan. She also played half of the latest shocking revelation in Star Wars: there’s another secret sister. What did you think of Bo-Katan’s role in the story? Tricia: Dave Filoni noted in interviews that he has a vision for Bo-Katan and a backstory for Satine and her secret sister. Undoubtedly, when the storytellers have this much invested in the characters then the story can be taken to new heights. Fans like to be left wondering, or imagining how two sisters can end up on opposite sides. If you go back and observe Bo-Katan’s actions in the story, the end game is obvious. I love this type of forethought. Satine got a lot of heat for her pacifism, but I believe she’s no less strong in her convictions and choices than her sister. Lex: I really liked how her sense of loyalty to Mandalore was always the subtle theme of her characterization. 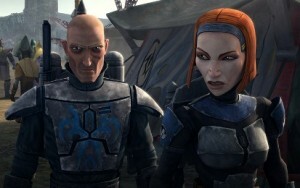 She serves Pre Viszla because she believes he’s the best hope for Mandalore. When he starts allying with the Sith brothers, she starts getting skeptical but defers to him, particularly because it offers the Death Watch the best chance to reclaim Mandalore. But once Viszla falls for Maul’s trap and the Sith assumes power, Bo-Katan puts her people first. In the end, she tells Obi-Wan to inform the Republic, even though that will lead to invasion. Deep down, when it comes to commitment to principle and to Mandalore, she’s not so different from her sister after all. But she’s a lot more fun to watch in combat! 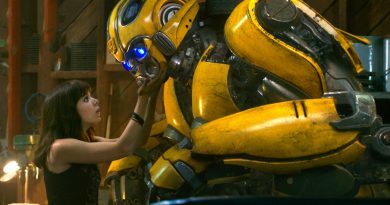 Megan: I really like her agency and how she doesn’t fall into any easy traps that female characters seem to fall into. She wasn’t in a romantic relationship with Pre Viszla, she wasn’t only a good fighter until the plot needed her to stop, and she wasn’t dragged along by other characters against her will. I was hoping we’d get to see more of her, but now that we can’t I like to assume that she became a respected and powerful leader as Mandalore continues its surely messy rebuild. On the third hand, I would have liked to see episodes about the backstory Dave Filoni has for the sisters, so that we could see why and when Bo-Katan and her sister started leading such different lives. A story of Mandalorian sisters splitting because one is a progressive pacifist and the other a traditional warrior could have made for an intriguing arc with two female leads. This arc also gave more insight into Obi-Wan’s character. Although we usually see Anakin as the Jedi most challenged by mastering his emotions, this time it’s Obi-Wan who’s letting his emotions cloud his judgment in his pursuit of stopping Maul. Did you like the angle taken on Obi-Wan in this storyline? Tricia: In the end, Obi-Wan mastered his emotions. I see Satine’s fate as inevitable. If she had died without Obi-Wan coming to try to rescue her, he would have always wondered and doubted himself. The line between love and compassion is always moving, so the Jedi Order at some point had decided to just create a solid divide. But that wall is an illusion. Qui-Gon seemed to be in the camp of following his emotions, and Obi-Wan has obviously learned a thing or two from his Jedi Master. The tragedy is that he couldn’t impart that lesson to Anakin. Probably because he had no lens on how Anakin had learned as a child that the only thing he had was his attachments to his mother. It made Obi-Wan as the Jedi ideal of balance all the more believable. Lex: Obi-Wan struggled with his emotions in this arc, but his difficulties came from a very different place than Anakin’s. The emotional struggles that Anakin faces ultimately have selfish origins. Anger and fear cloud his judgment during the war, just as they ultimately do in Revenge of the Sith. He doesn’t want power so he can do his duty, but to enable him to achieve his personal goals. For Obi-Wan, by contrast, it’s an issue of guilt – he blames himself for not having killed off Maul for good the first time, so he feels a deep sense of responsibility to finally take him down once and for all. It’s a selfless motivation – trying to protect the galaxy from the consequences of his failure – that leads him to be more insistent on pursuing what he perceives as his duty to stop Maul than maybe is prudent. Megan: I really like what Lex said about Obi-Wan’s guilt, because there was definitely a sense that he was in this fight to clean up the mess he made when he didn’t kill Maul the first time. When Satine got involved Obi-Wan probably saw his plans crashing down. Obi-Wan took a page from Anakin’s book when he took the Twilight to Mandalore against the Council’s suggestion, and I was reminded of Yoda telling Luke in The Empire Strikes Back that it is in fact inaction that could save his friends. 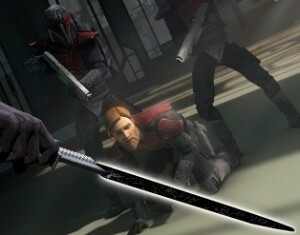 If Obi-Wan hadn’t gone to Mandalore, would Maul have used Satine against him? I think the angle taken with Obi-Wan was in-character and thickened the plot while, as the next question discusses, ultimately bringing Obi-Wan to a more mature and dutiful place than he had been before. 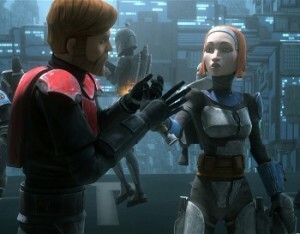 Finally, Obi-Wan must cope with his grief over Satine’s death in his arms at Maul’s vengeful hand. With that loss weighing on him, how do you think Obi-Wan would move forward? Tricia: Because he has to. It’s really that simple. From his earliest years Obi-Wan has been taught that the Jedi are the line in the sand. 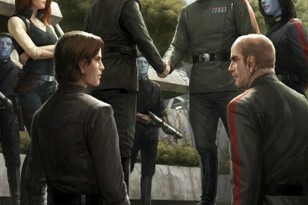 He had made a choice to value his oath to protect the Republic and set aside his feelings for Satine. It is obvious Satine has a code of honor, a belief in an ideal. If nothing else, a character like Obi-Wan would have found strength in honoring her death by not failing to keep up the good fight. Lex: It’s another great contrast with Anakin, too. For Anakin, the death of his mother motivated him to seek enough strength and power to protect his other loved ones from untimely deaths. It made him more desperate to cling to his attachments. For Obi-Wan, on the other hand, Satine’s death would only reaffirm for him the importance of being able to let go of attachments. No doubt he deeply mourned Satine’s death, but then found the emotional strength to go on. Megan: I’m with Tricia on this one. It was less a big decision for Obi-Wan and more a confirmation that his worldview worked for him. He was able to move on because he believed in the Jedi way, and also because he’s naturally calm and selfless and became more so in his training. If we can bring the EU in, this also reminded me of the death of Tahl, Qui-Gon’s partner. It seems like every Jedi in Qui-Gon’s line has to decide how they’ll deal with attachment, although it’s convenient for most of them that the other person is dead when they do it. In Part Three, we’ll discuss the Ahsoka arc, its extensive use of female characters, and the series finale’s impact on Anakin and Ahsoka.